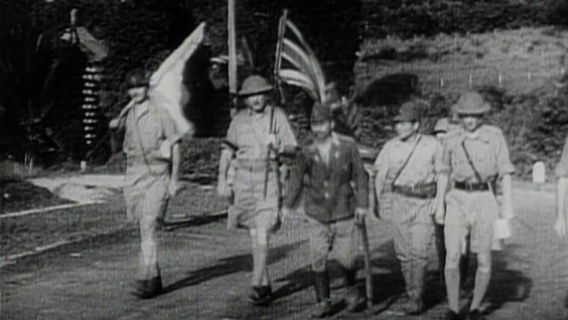 We’ve just added to the site for subscribers a video about the Japanese victories at the end of 1941 and the the start of 1942. And as victories go they didn’t come much bigger than the Japanese triumph at Singapore in February 1942, when more than 60,000 troops under the command of the British General Arthur Percival surrendered to around 35,000 soldiers of the Imperial Army. Churchill called it ‘the worst disaster and largest capitulation in British history’. And still today historians argue over exactly why this could have happened. By February 1942 these ‘various sub-human specimens’ had managed to over-run the British in Hong Kong, invade Thailand, conquer Malaya and humiliate General Percival in Singapore. And let’s not forget, of course, that they had also managed a sneak attack on the Americans at Pearl Harbor on 7 December by sending a carrier attack force out – in secret – to the middle of the Pacific. Yet, as John Dower’s brilliant book ‘War without mercy’ demonstrates, the triumphs of the Imperial Army in these early months of the war in the Pacific did not make the Allies suddenly change their minds and respect the Japanese. Before December 1941 the Japanese had been ridiculed as ‘ape-like’ and ‘unable to fly because of their slitty eyes’, yet once they had proven that, in many ways, they were better soldiers than the Allies, they were now seen as an ‘inhuman race’ precisely because they had proved so effective on the battlefield. ‘Only animals can fight like that’ as one ex US Marine put it to me. It’s a revealing history, I think, as it shows the immense and corrosive power of racism. First, the Japanese were believed to be ‘subhuman’ because they were perceived as incompetent fighters, and then when they proved tough fighters this only served to reinforce the view that they were ‘subhuman’ because they fought better than ‘humans’ had a right to….